There are so many options when it comes to choosing a bathtub style. However, equally or almost more important is the finish. There are many different material choices, and you should choose wisely. What it will ultimately come down to has to do with the combination of looks, comfort, ease of maintenance, and, of course, cost. Here are some of the most common options. Fiberglass: Also referred to as FRP, or fiberglass-reinforced plastic, this is typically going to be the least expensive bathtub material. A fiberglass bathtub is made by forming different layers of fiberglass into the desired shape, then coating it with a resin. The advantages are low cost, light weight, ease of installation, and a finish that can be repaired. On the negative side, fiberglass tubs are thin; they flex and don’t have a stable feel; they’re not very durable; and the finish is prone to fading, scratching and cracking. 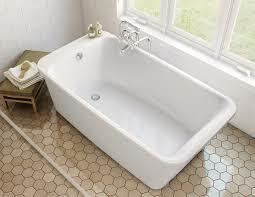 Porcelain on steel: Also sometimes called enameled steel, this is another inexpensive and very common bathtub material. The tub is stamped from a thin sheet of steel, then finished with a layer of porcelain enamel. These tubs are durable and easy to clean. The finish is resistant to most common chemicals, and retains its gloss for a long time. They’re also especially useful when replacing fiberglass or acrylic tub/shower units, as they fit in the same 5′ opening and can be finished off nicely with a ceramic tile surround. On the downside, they’re heavier than fiberglass or acrylic; the surface can rust and chip under impact; and you’re very limited in the number of shapes and sizes available. Acrylic: Acrylic tubs use fiberglass sheets for reinforcement underneath vacuum-formed sheets of colored acrylic. The advantages are pretty much the same as for fiberglass, although acrylic tubs are more expensive. Disadvantages are that the finish can scratch or discolor over time, although the better grades of tub finishes have now reduced that problem to a minimum. You also have a lot of choices of shapes, sizes and colors. Acrylic is a good all-around choice, although it may lack a certain high-end appeal for some people. Cast iron: If you’re looking for a material that will last, this would be it. 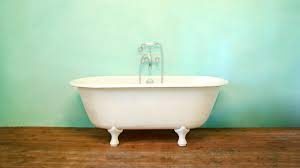 Cast iron tubs are made by pouring molten iron into a mold of the desired shape, then smoothing it and coating it with a thick layer of enamel. It’s probably the most durable tub available, and the finish is resistant to chipping, scratching and denting, as well as most types of chemicals. There are a number of different colors available, and there’s a richness to cast iron that’s hard to match. The heavy material also tends to retain the water’s heat. On the downside, these tubs are extremely heavy and require extra labor to install. They’re also typically going to be among the most expensive tubs on the market. Here are some of the LESS common bathtub materials. While they are not much-talked about, they are worth knowing. Solid-surface materials: Solid-surface materials are relative newcomers to the bathtub market. They’re durable; they retain heat well; there are a variety of subtle, natural-looking colors available; and the finish can be repaired if needed. They can also be made in a variety of shapes and sizes. On the downside, they’re somewhat heavy and relatively expensive, and may require a long lead time to get. 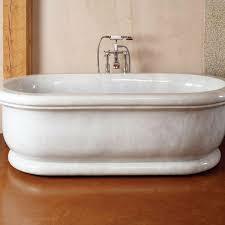 Cultured marble: These tubs are made from crushed limestone mixed with resin, then finished with Gelcoat. You have a lot of options for color, size and style, and the Gelcoat finish used with cultured marble is more durable than that used with fiberglass. The cost typically falls somewhere between acrylic and cast iron. 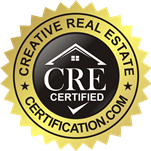 Ceramic tile: Ceramic tile tubs can be made on site to whatever size and shape you desire. You have more design options with this material than any other. However, you’ll have to deal with the maintenance of all that grout, and the irregular interior surface may not be the most comfortable to relax on with bare skin. Stone and wood: You can custom order a bathtub from a variety of natural stone materials, including granite, marble, onyx, travertine, basalt, sandstone and other materials. These tubs are extremely heavy, and require special structural framing to support their weight. You can also custom-order a bathtub made from teak and certain other woods. As you’d imagine, these will be very expensive. And, in the case of wood and some of the stones, it’s going to require a lot of maintenance in order to retain the tub’s original beauty. Marble bathtubs are GORGEOUS. If I could afford one, I would definitely buy one. They’re really old-world, classic. Personally, I prefer whirlpool tubs over claw foot. Yeah, I’ve never been a fan of free-standing tubs. We have a jacuzzi in our master bathroom, and I would never want any other tub. 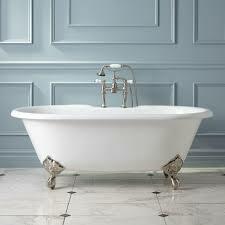 However, I agree that marble tubs are gorgeous, and think they would be great in a guest bath.